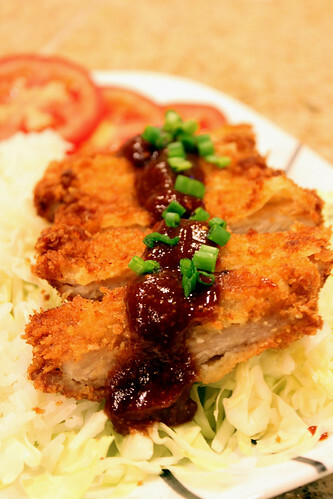 Did you know the “Ton” in tonkatsu means pork? If yes, maybe I was the only one who didn’t know this. 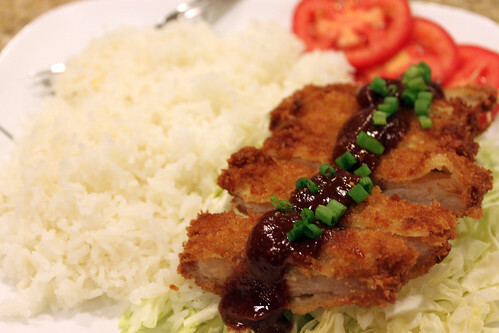 I always wondered why it wasn’t called Pork Katsu like the chicken version is called Chicken Katsu. Anyway, I enjoyed making tonkatsu because I had all the ingredients in my pantry and this took me less than an hour to make. This is especially good for a weeknight dinner. I think I spent more time washing the dishes than cooking this meal. If you don’t want to use pork, use chicken breast halves or fish fillets instead. I want to try to make this with catfish fillets. To make the Katsu sauce, whisk ketchup, Worcestershire sauce, soy sauce, garlic powder and crushed black pepper until combined. Set aside. 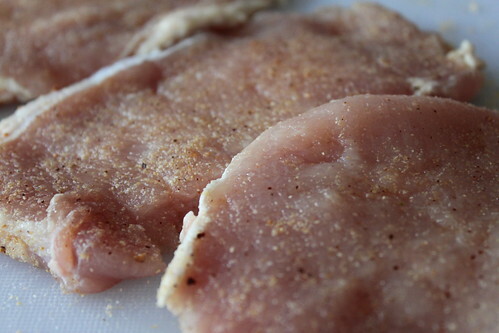 Place pork loin chop in between plastic wrap and pound each pork loin chop until it is about 1/4-1/2 inch thick. 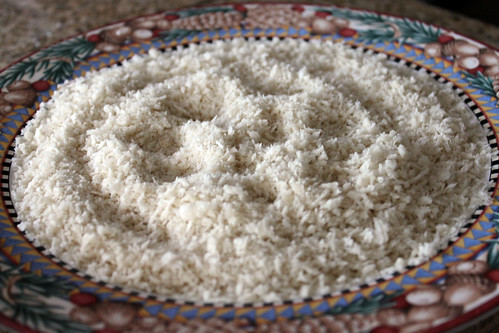 In a small bowl, Mix garlic powder, salt and crushed pepper together. Season both sides of each pounded pork loin. Create an assembly line with 3 plates. 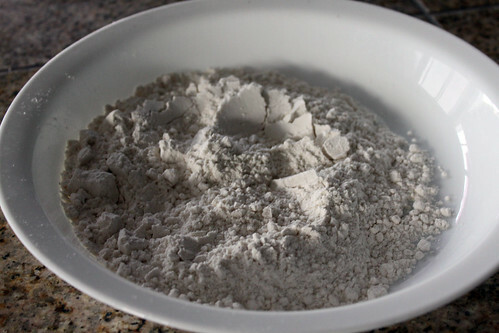 Add all-purpose flour to the first plate, eggs to the second plate, and panko bread crumbs in the third plate. 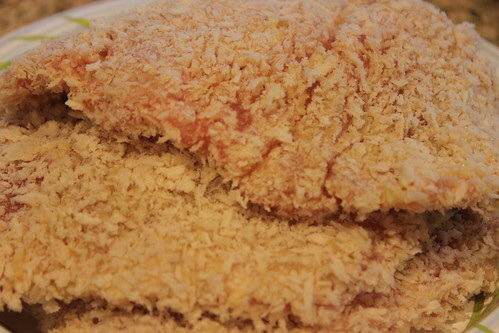 Dredge pounded pork loin in flour, dip in egg, and finally coat with panko bread crumbs. Heat frying pan on Medium High and add enough oil to cover half the tonkatsu. 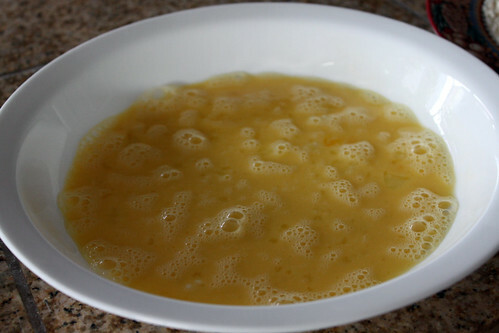 Fry each side for about 3-4 minutes or until golden brown. 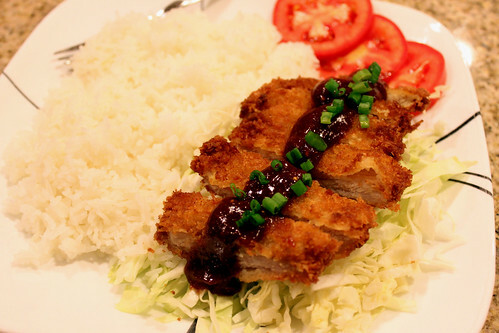 Slice and serve with Rice, shredded cabbage, and katsu sauce.